This is a “repost’ of a post I wrote on one of my other blogs a long time back. Republished here since it goes with the theme of this blog and hopefully someone somewhere will find it relevant even today. Its been about two weeks since I got my iBook G4 and I must say, I’m loving it. 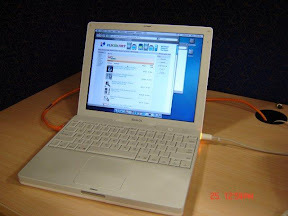 The ibook looks more like a toy than a ‘real’ computing machine and that would deter most ‘corporate types’ from using it. You, obviously, wouldn’t want your boss catch you playing with a white thing in office. Geeks like me, on the other hand, should have a field day with this one. Apple has, in recent times, been working hard to change its image, as a company admired by the creative people, to one admired by the creative people as well as the geeks. And we all know, the world uses tomorrow what the geeks use today. The ibook and powerbook lines as well as the biggest draw of ’em all, Mac OS X, are excellent geek pullers and OS X in particular is what pulled me towards apple. Let me tell you, though, that apple makes excellent hardware too and you would appreciate this only once you’ve actually used an apple machine. The ipods as well as all their computers are engineered almost perfectly. OS X does take the cake because, simply speaking, is the best looking Unix of them all. Yes, I said Unix. Apple is probably the first company to have released a commercially supported desktop operating system based on Unix, or FreeBSD, to be precise. I’ve used FreeBSD on the desktop earlier and have been dabbling with Linux since the better part of the last decade, so I’m not new to PC unixes. What’s different about OS X is the way “It just works”. Probably because apple has tighter control over the hardware that goes into those machines, but that does’nt make OS X any less ‘cooler’ than it already is. Finally I can get some work done, instead of trying to get some stupid hardware or software working with my system. And yes I did load up linux on it. I loaded up the latest darling of the masses, Ubuntu Linux, on the ibook and when I powered it up, it looked so pale and featureless in front of OS X that I couldn’t bother touching it even with a 10 feet pole and so I’m back to OS X only on my lovely ibook. The first thing I tried with the ibook was playing music and I was kinda surprised. The tiny speakers do have a lot of power in them and, though, not loud enough to make you do the macarena, the quality of the sound produced is pretty decent considering the small package they come in. I tried watching a Jimi Hendrix DVD on the system and it played flawlessly in the iDVD player which comes up as soon as the system recognizes that a playable DVD has been inserted. OS X also displays different icons when you insert a CD-R and a CD-RW. Though, a small thing, it does make the system much more pleasant to use. Have you ever tried connecting a PC portable to a network socket and struggled with the location of the ports. Most, if not all, PC portables have all the ports at the back of the system which makes them pretty hard and difficult to reach to. The iBook has all the ports on the left side of the system and the optical drive and the power socket at the right side. Simple and neat and you don’t have to lift the turn the notebook 180 degrees ever just to attach a network cable, Exactly like it should be. One gripe I have with apple is that they still ship one button mouse/trackpads with all their systems. Maybe, its just their way of doing things, but I do miss the right mouse button at times. As of now, I’m still getting used to their ctrl-click combination in place of the right mouse button.